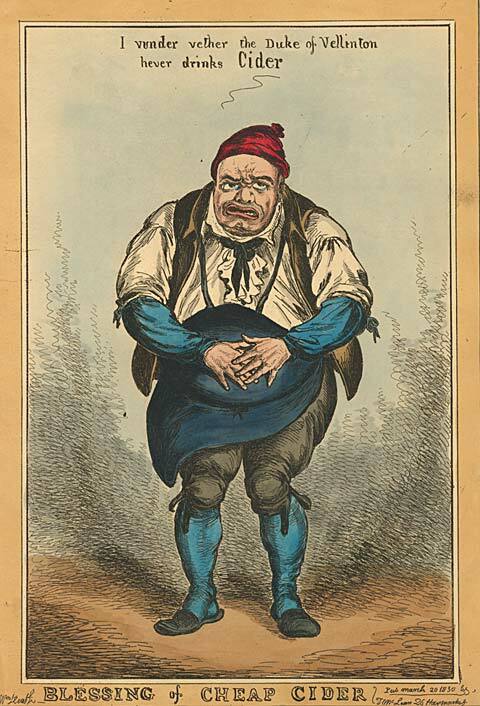 Nineteenth-century caricaturists were similar to sociologists. They made a living studying how people around them lived, what they ate, what they wore, and what they cared about. However, they observed society without the impartiality of a trained sociologist. Instead, the caricaturists judged, criticized, and ultimately mocked their subjects in their bold and biting satires. In the following prints, the artists all leveled criticism at the “excesses” of nineteenth-century England: the over-consumption of alcohol and food, the hypocrisy of gossip, and the extremes of the animal rights movement. Blessing of Cheap Cider. William Heath, published by T. McLean, 26 Haymarket, March 20, 1830. Punch cures the Gout, the Colic, and the ’Tisick. James Gillray, published by H. Humphrey, 27 St. James’s Street, July 13, 1799.
the very best of physic. In the etching, three individuals find the medicinal cure to their ailments in the punchbowl. The bowl is filled with punch, a mixture of at least five or more ingredients of liquor and fruit juices made popular in the eighteenth century. Only the wealthy could have afforded an exquisite Chinese porcelain vessel like the one on the table. The three “jolly” characters suffer from the maladies in the song. The obese gentleman on the right is afflicted with a severe case of the gout in his extremities. Gout was believed to attack men who overindulged in heavy wines and rich foods. The man has wrapped his legs, feet, and hand in soft flannel as a means to induce perspiration, thought to be a safe and efficacious method to discharge gouty matter.25 The fashionable woman suffers from colic, a disease that causes pain in the bowels and costiveness. The last character is diagnosed with ’tisick, or consumption, which today is known as tuberculosis, a disease of the lungs that causes the wasting away or atrophy of the body. William Buchan, author of Domestic Medicine, wrote in 1785, “consumptions prevail more in England than in any other part of the world.”26 To prevent further flair-ups of the diseases satirized in Gillray’s caricature, Buchan recommended abstaining from strong liquor. 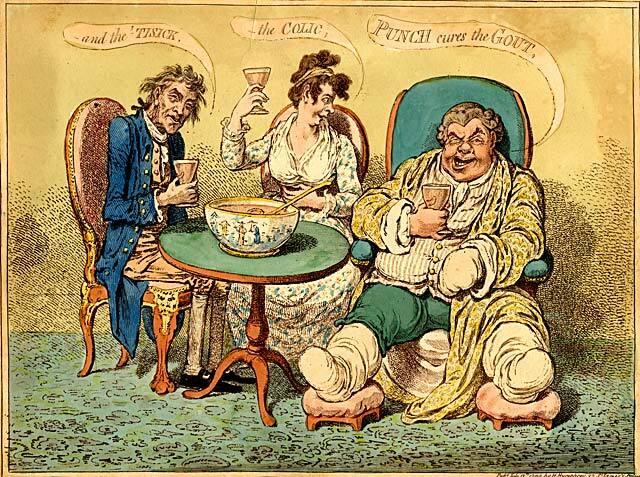 These three characters in this caricature chose to ignore prevailing medical opinion and instead turned to alcohol to find relief from their symptoms. Indigestion. 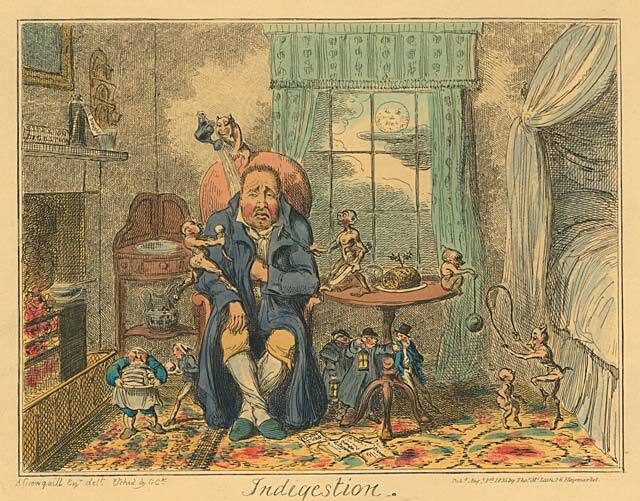 George Cruikshank, published by Thomas McLean, 26 Haymarket, August 1, 1835. Besides excessive alcohol consumption, satirists provided social commentary on the over-consumption of food. 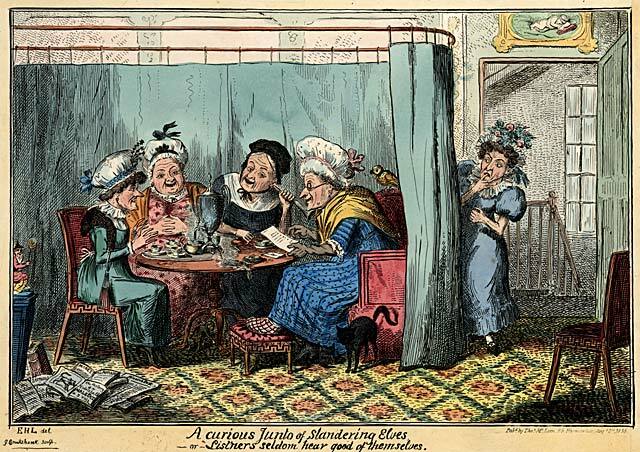 Bread, potatoes, and tea were staples in the diet of many in England.27 But for the middle and especially the upper classes, gluttony was seen as fashionable, even socially accepted. Historian Sally Mitchell writes, “English middle and upper classes ate more roasted and cooked meat (and fewer stews or casseroles) than did Europeans of a similar class.”28 A good English dinner included all types of meat, including ribs of roast beef, boiled turkey, and enormous hams, all served at the table at one time.29 In the 1830′s it also became fashionable to eat at a late hour, following the custom of Queen Victoria who dined as late as eight o’clock.30 The protagonist in George Cruikshank’s 1835 piece, “Indigestion,” suffers from the effects of indulging in a fashionably late night of overeating. A dinner ticket from the evening’s festivities lies on the floor. His furrowed brows and flushed cheeks indicate he is uncomfortable. In an attempt to help him cool down, a little imp pours water down his back. The man clutches his chest (a touch of heartburn perhaps?) and it takes little imagination to hear a woeful groan emanate from his mouth. Though not life size, two servants remove trays of empty plates, demonstrating just how much the man ate that evening. The heavier servant has plates stacked to his chin. An imp on the nightstand tempts the main character with still more food. A curious Junto of Slandering Elves -or- List’ners seldom hear good of themselves. George Cruikshank, published by Thomas McLean, 26 Haymarket, August, 1835. In this amusing, undated, and unsigned cartoon, the caricaturist pokes fun at the lengths the Animals’ Friend Society would go to protect and promote kindness to animals. Animal rights groups, along with many other humanitarian movements, had their beginnings in Victorian England. The oldest animal activist group, the Society for the Prevention of Cruelty to Animals, was founded in England in 1824. Its goal was to promote humane treatment of work animals, particularly cattle and horses, as well as household pets. With a missionary zeal the Society produced tracts and sermons to “effect a change in the moral feelings of those who had the control of animals.”31 It also prosecuted those who endangered the lives of animals. 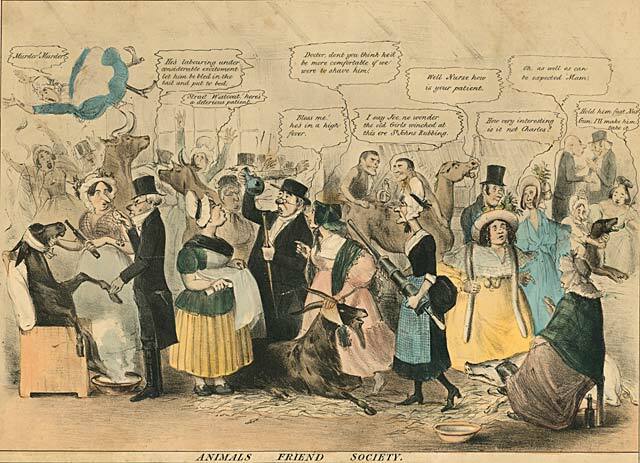 One of their original members, Lewis Gompertz, withdrew from this early organization and founded the Animals’ Friend Society in 1832. His book, Moral Inquiries on the Situation of Man and of Brutes, was the first systematic treatise to defend animal rights.32 Gompertz also created inventions to make animals’ work loads lighter and more comfortable. Well-known Quakers such as John Cadbury (of chocolate fame) joined him in his reform movement.